Hi there, friends, it's DAY FOUR of Papertrey Ink's December release countdown. What do you think of what you've seen so far? There's so much more to see today and tomorrow! 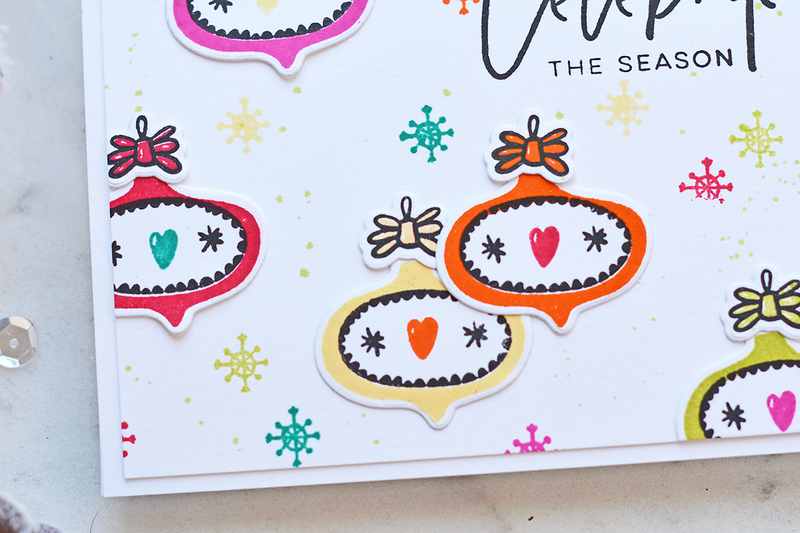 I am sharing a project I made with BOLD BORDERS: LOVE, the latest in the Bold Borders series, and GLORIOUS GLOBES: DECEMBER, also the latest in a year-long series. 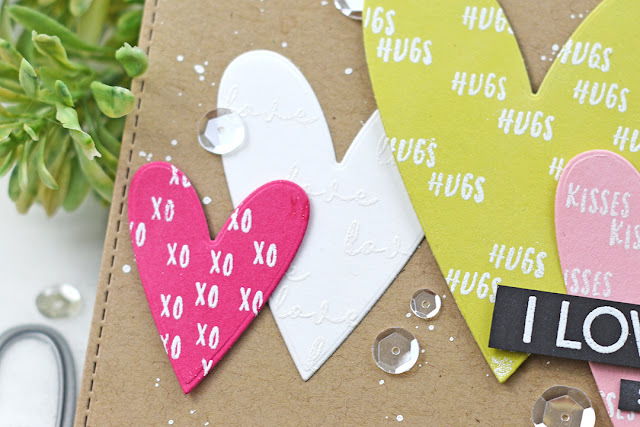 Both are heart/love themed, just in time for upcoming Valentine's Day crafting. The December Release products will be available at 10 pm December 15 in the Papertrey Ink store. 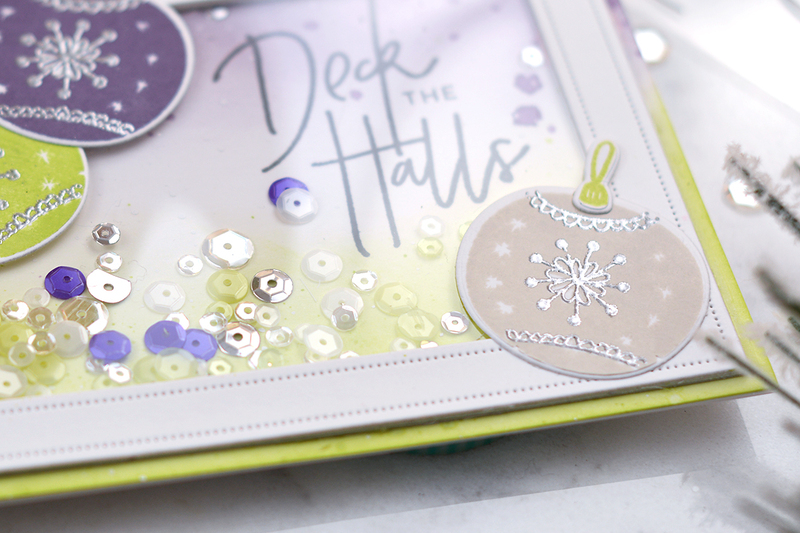 I've combined both products on my card today, as well as a few other new December products. 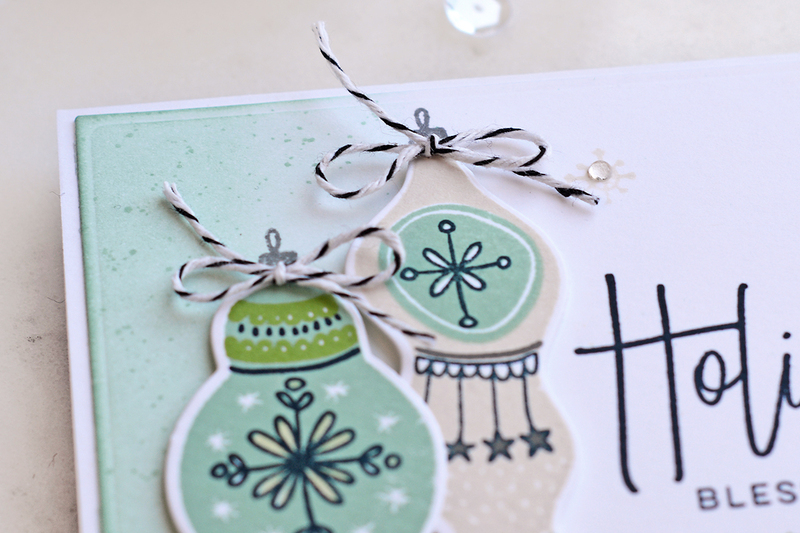 To begin, I die-cut and stamped the large globe from GLORIOUS GLOBES: DECEMBER. I love these layered hearts! I placed my globe onto the largest heart from the FROM THE HEART die set. 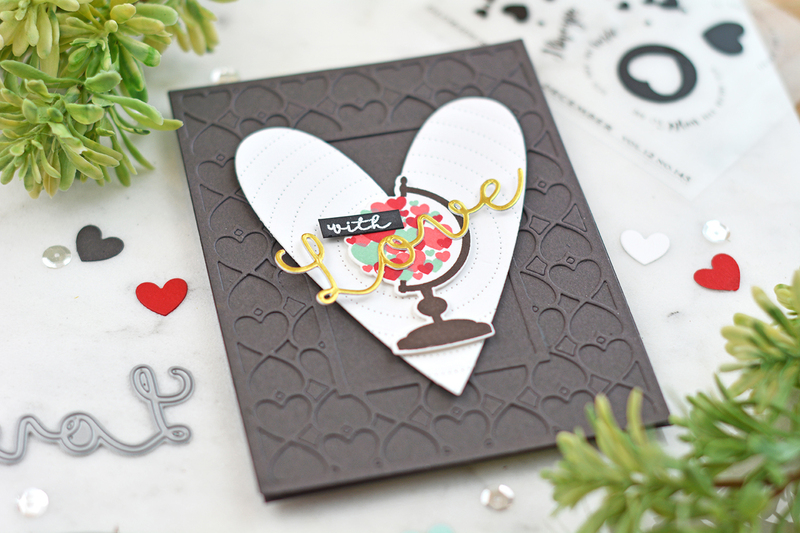 For a fun bull's eye detail, I added the concentric pierced circle detail to the heart using the new NESTING BASICS: PIERCED CIRCLES die set. 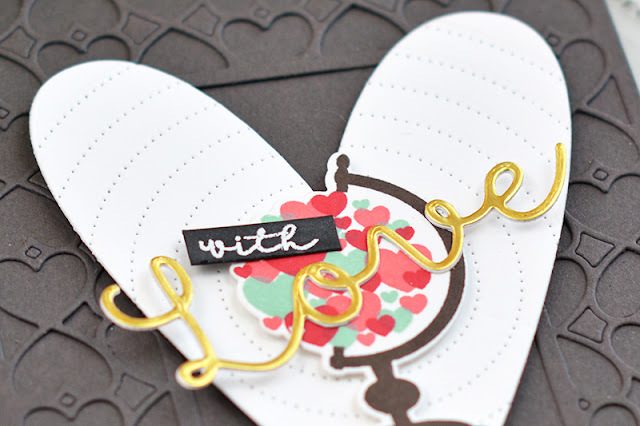 I added the "with love" sentiment by combining the stamped word "with" from FROM THE HEART and a metallic gold "love" die-cut from the BOLD BORDERS: LOVE die set. 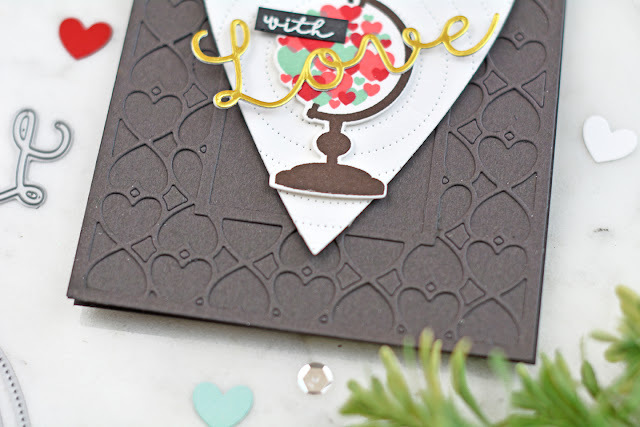 For my background, I die-cut BOLD BORDERS: LOVE from Smokey Shadow cardstock and placed it on a Smokey Shadow card base, which added some subtle tone-on-tone texture. For more featured products and project inspiration, visit the Papertrey Ink blog. Supplies are displayed and linked below. (New December release products will be available December 15.) Where available, I have used affiliate links. If you make a purchase through these links, I receive a small commission at no extra cost to you. I appreciate your support! Hello and welcome to Day Three of Papertrey Ink's December release countdown. Be sure to check out DAY ONE and DAY TWO over on the PTI blog if you need to catch up on products already introduced! It's another great release! 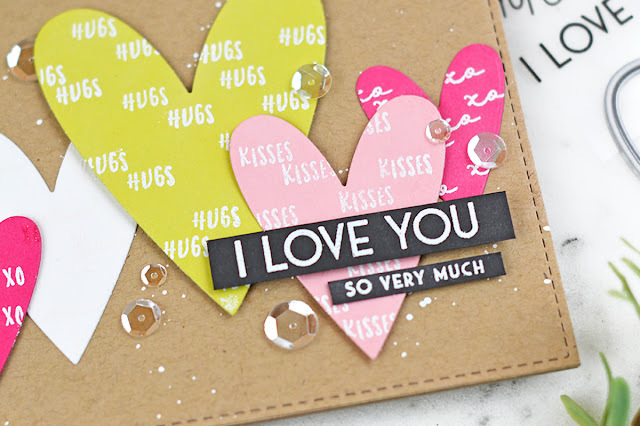 Today I will be helping to introduce FROM THE HEART, a sweet little Valentine's/Love themed mini set, along with the latest in the Sentiment Staples series, SENTIMENT STAPLES: I LOVE YOU. I've combined both sets on my project today. Let's talk about FROM THE HEART first. 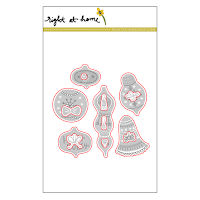 This set has a large solid heart heart stamp image along with a multitude of words to build your own sentiments. 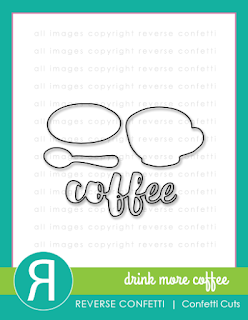 The two fonts are just darling - one is an all-caps brush style and the other a handwritten script style. 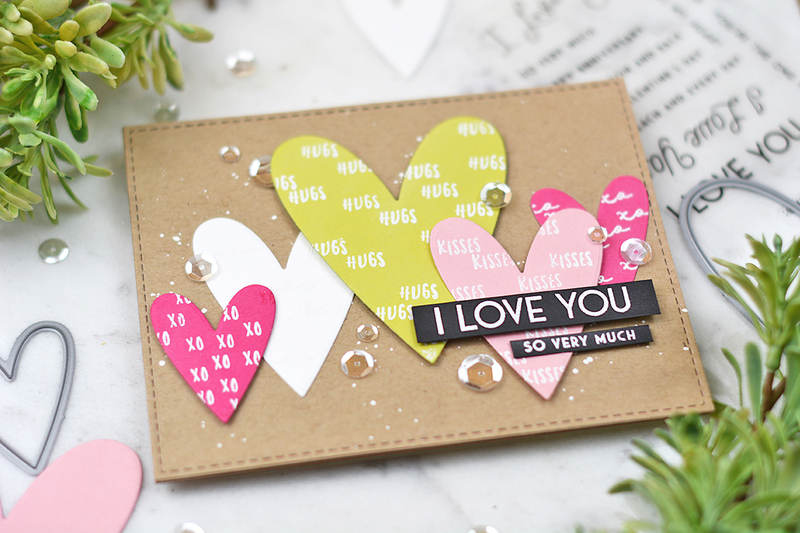 Instead of building a sentiment, I used the individual words in a more graphic way to add pattern to my FROM THE HEART diecuts. 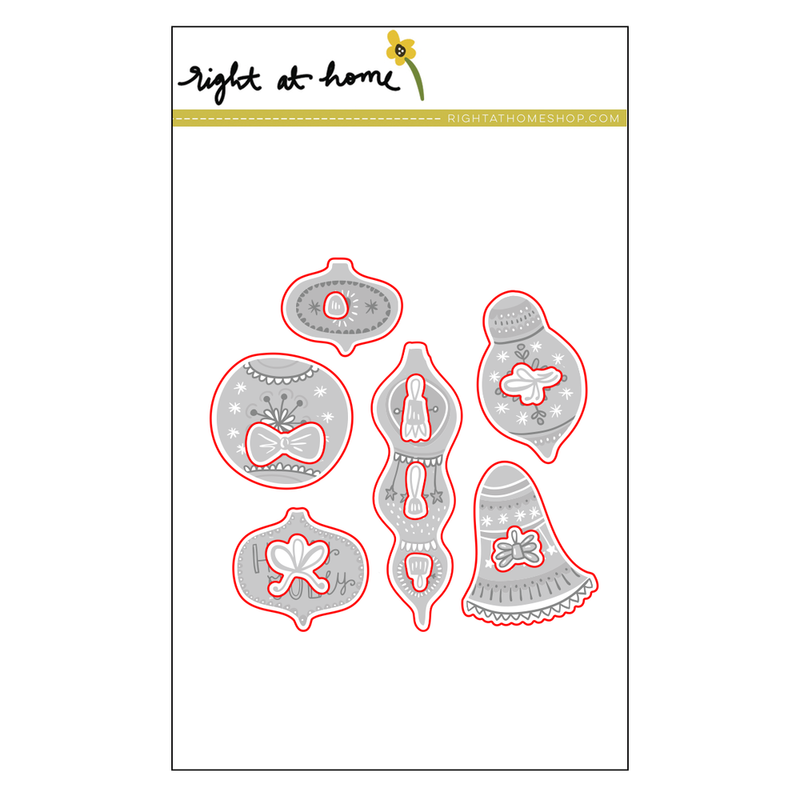 The companion die set has four nested heart dies, one that fits the heart image in FROM THE HEART, and then three other sizes too. Here's a closer look at some of those words/fonts. I stamped the words randomly and white embossed for a nice pop. 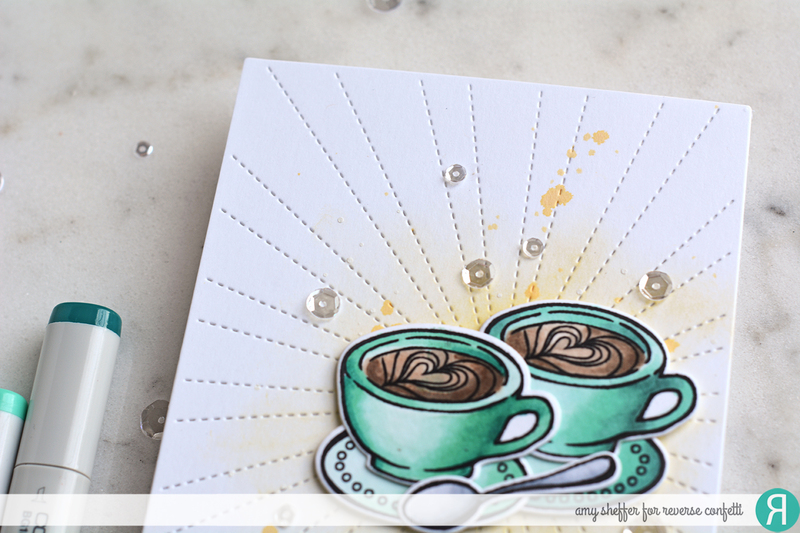 I even white embossed on the white die-cut. 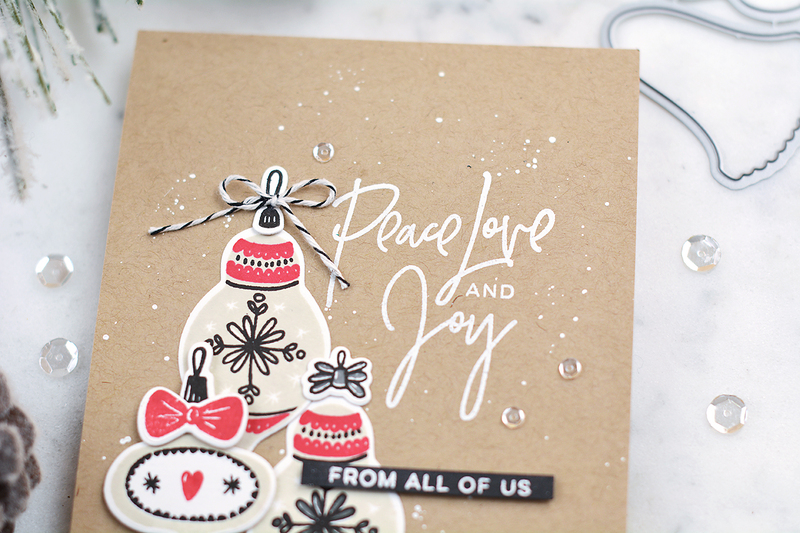 Love the subtle texture of the white-on-white embossing. 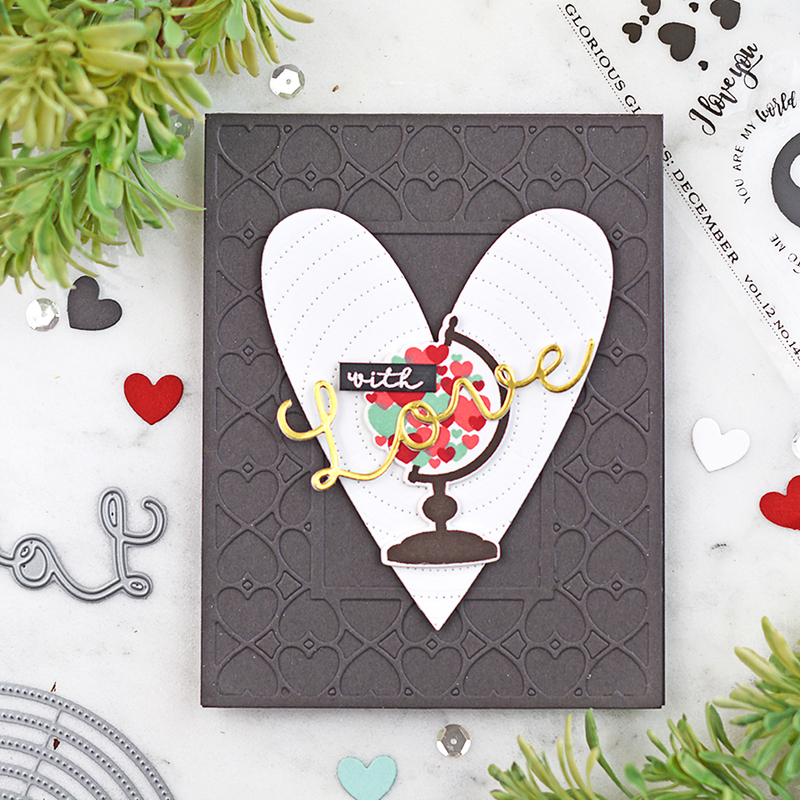 Last, I added a larger sentiment from SENTIMENT STAPLES: I LOVE YOU heat embossed in white on black card stock. I lightly splattered the Classic Kraft background panel, layered the hearts on top, and accented with clear sequins to finish. Happy Sunday! Just popping in today to share the last few projects I made with Right At Home's new BELLS & BAUBLES stamps and coordinating BELLS & BAUBLES dies. 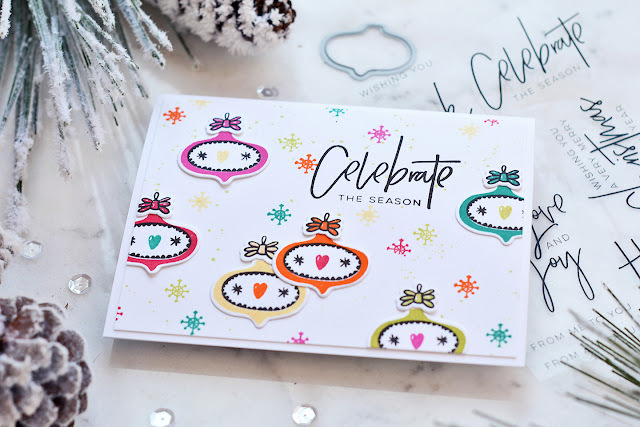 Such a cheerful and festive set -- I had so much fun making all of these projects! 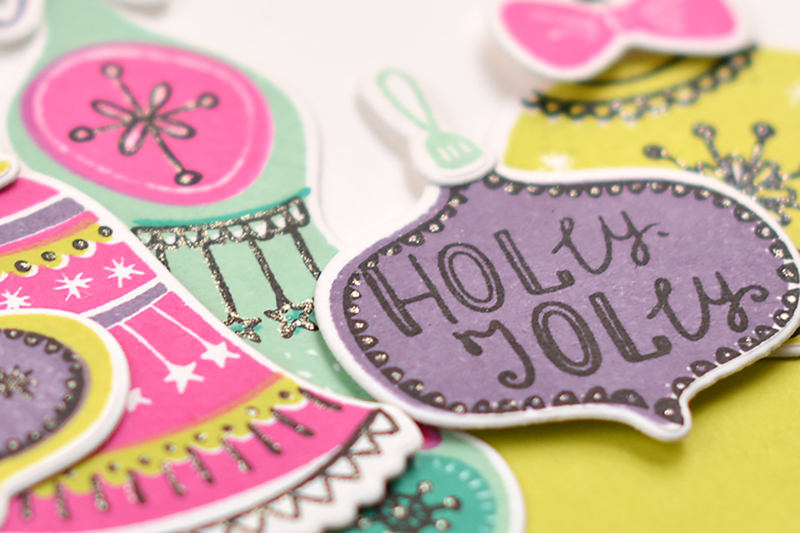 The first two cards today feature brighter and more festive color schemes than what I've shared previously. 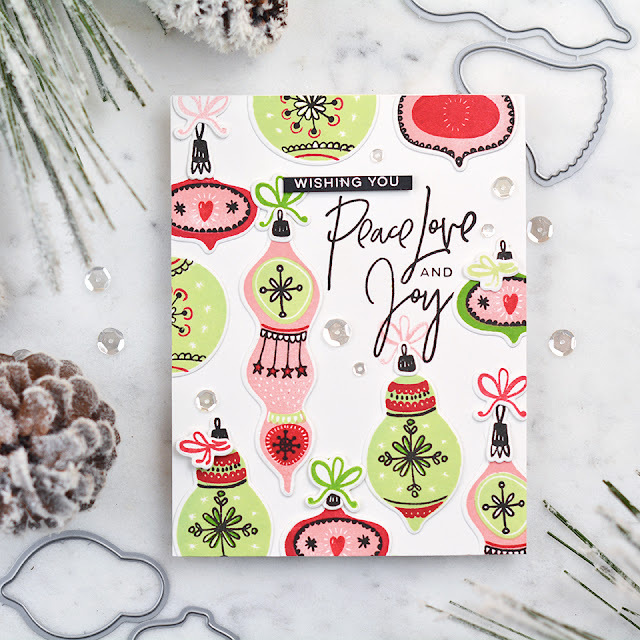 For this card, I stamped the smallest ornament in rainbow colors, arranged them around a PEACE LOVE JOY sentiment and then filled in with colorful stamped accents. 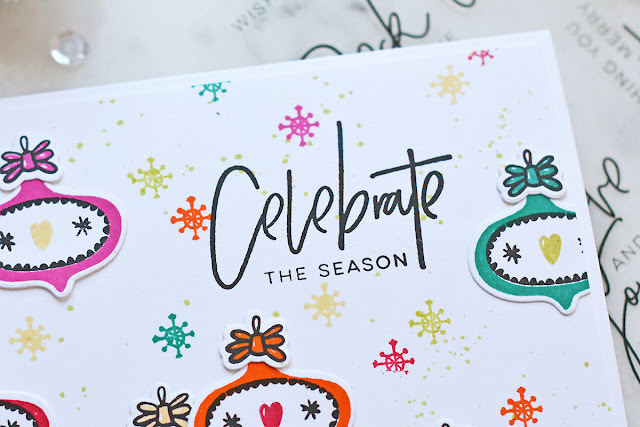 I'm usually a big fan of neutrals and even traditional reds and greens for my holiday cards, but this ended up being one of my favorite cards with this set. 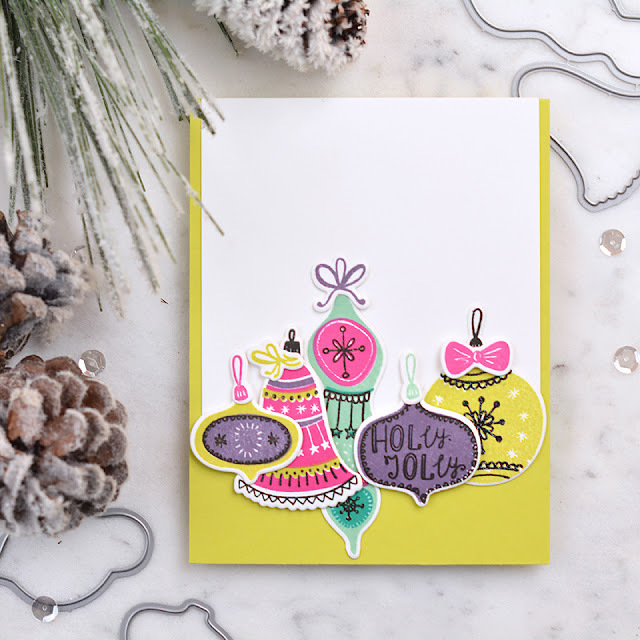 What's not to love about bright, cheery colors, right?! I couldn't resist creating a shaker card for my last card. 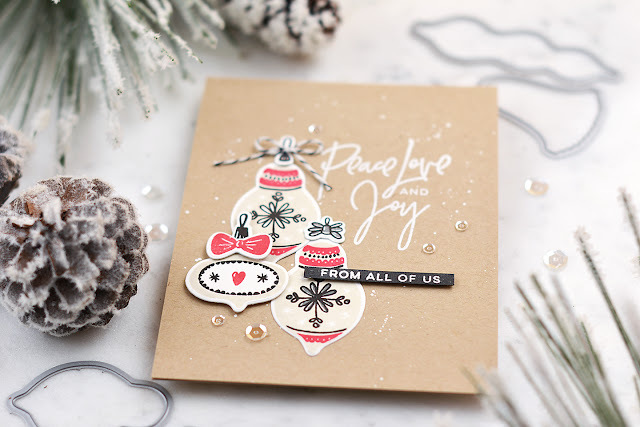 I chose the ball ornaments for this card, and instead of stamping all the layers, I just stamped one solid background and then silver embossed line detail image. My background is ink blended in lime green and purple. 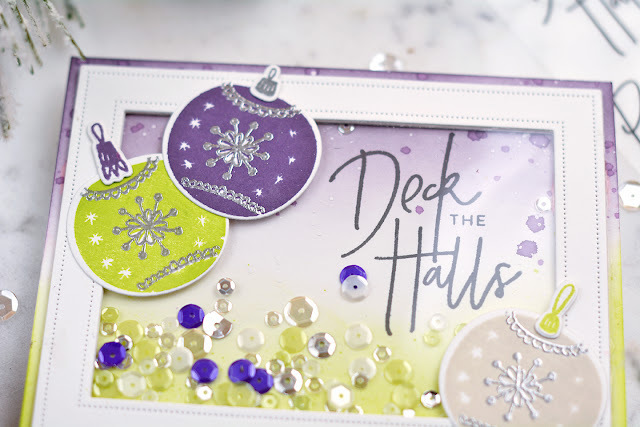 I layered my shaker frame onto that and filled it with a coordinating sequin mix. 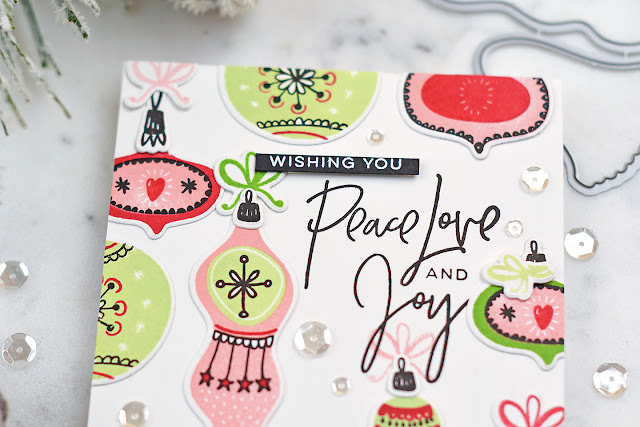 The sentiment, once again, is from PEACE LOVE JOY, which I really love. 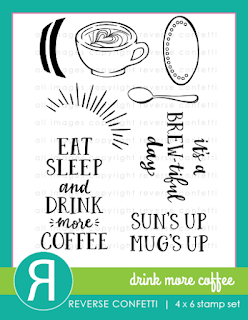 The mix of type with large handwritten words and the overall large size are so eye-catching! Hello, hello! It's hop day at Reverse Confetti. 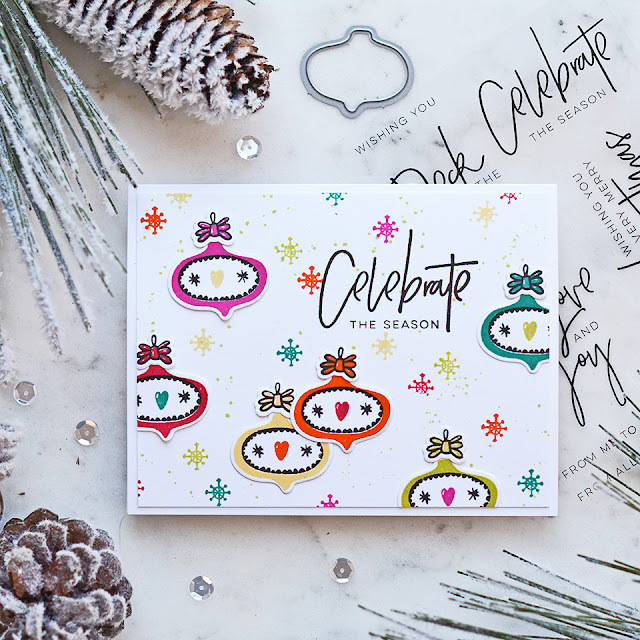 Join us for new creative inspiration as well as a fun look back at the year's favorite projects. Lots of eye candy today!! 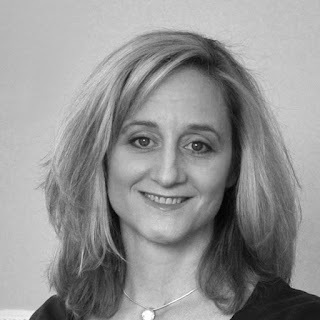 You should have arrived here from Melissa Phillips and will be heading to Tricia Barber next. 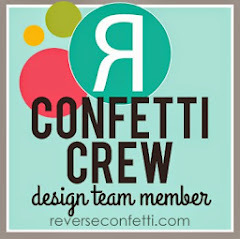 To start at the beginning, head to the Reverse Confetti Blog. My card for today features DRINK MORE COFFEE from our November release. 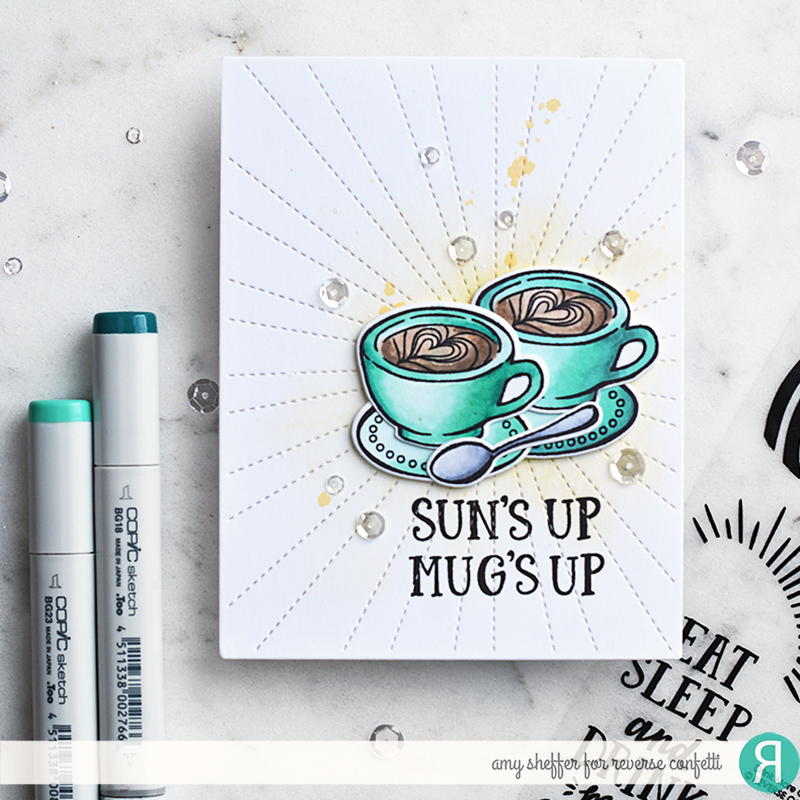 I stamped and colored two turquoise coffee cups and placed them onto a yellow ink-blended and splattered STITCHED RAYS COVER PANEL diecut. I added some clear sequins for a finishing touch. Each designer has also been asked to share three favorite projects from 2018. What can I say? 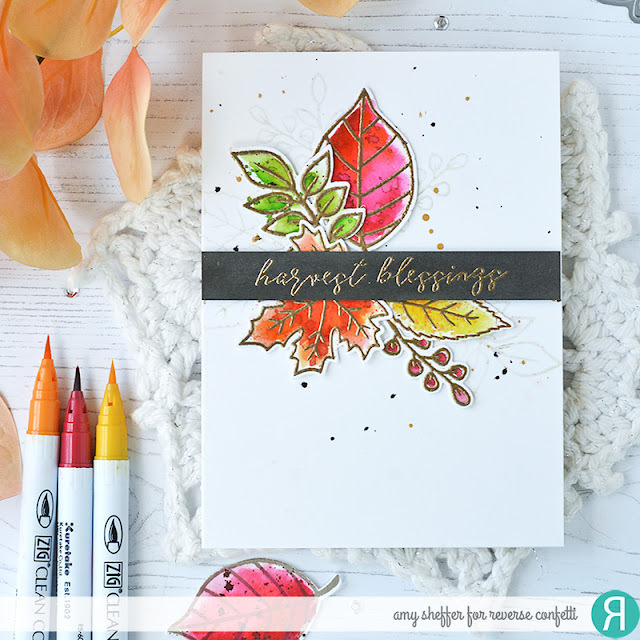 Fall is my favorite, and these FALL FOLIAGE leaves are the best! 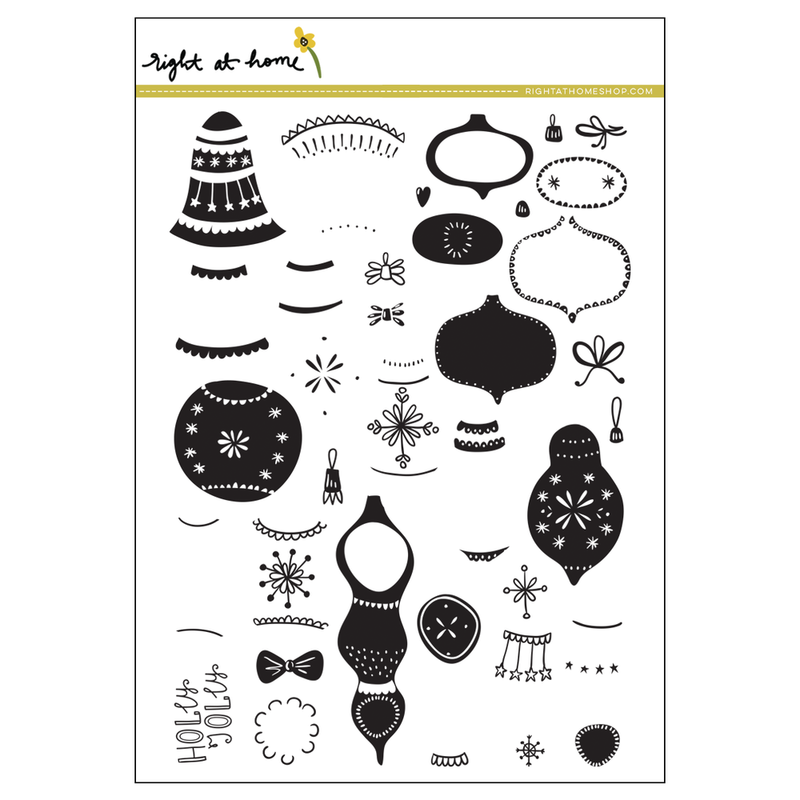 The sweet HOLIDAY GNOMES are so adorable, and I love the BAG & TAGS CREATOR sacks. 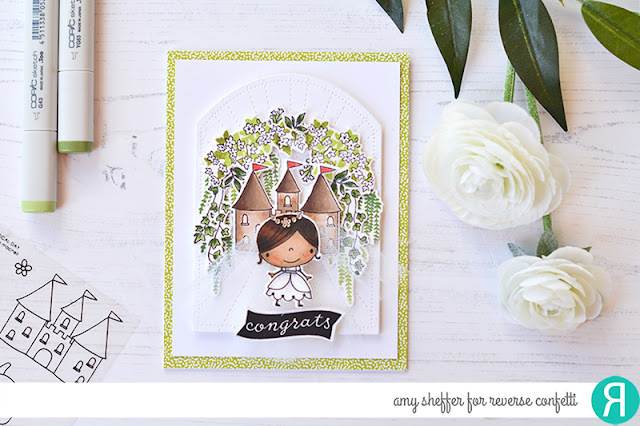 My royal wedding card made the cut because it was just so much fun to create! MAGICAL DAY, HANGING BLOOMS, BITTY BANNER, STITCHED RAYS COVER PANEL, and PIERCED ROUND TOP LAYERS. Thanks so much for visiting today. Enjoy the hop! Supplies are displayed and linked below. Where available, I have used affiliate links. If you make a purchase through these links, I receive a small commission at no extra cost to you. I appreciate you and your support! 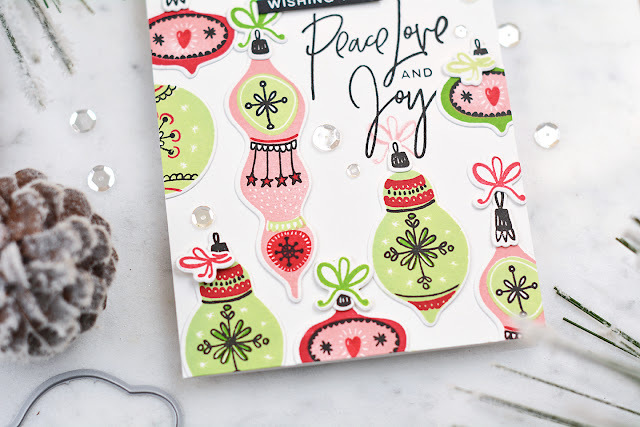 I have two more cards to share today, both featuring Right At Home's new BELLS & BAUBLES stamps and coordinating BELLS & BAUBLES dies. I had so much fun with this set! In addition to all the ornaments in the set, there is one sentiment, "Holly Jolly," which fits perfectly into one of the ornaments. 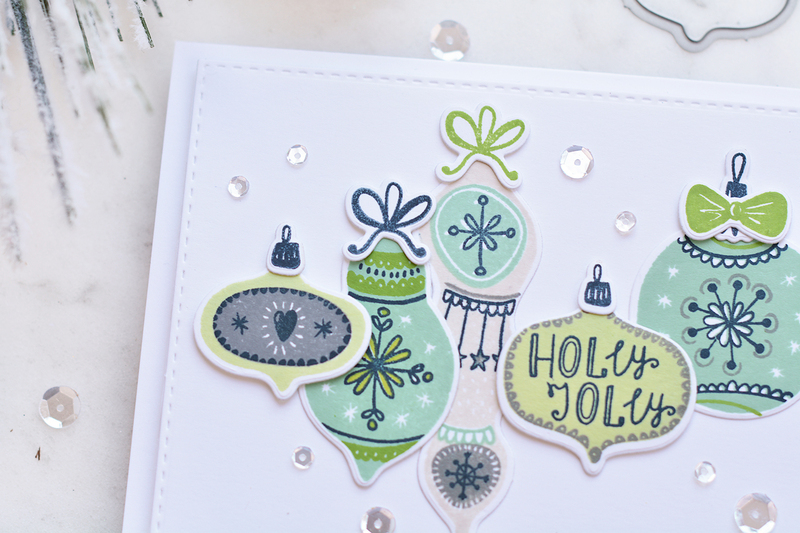 To finish this card, I placed all the ornaments onto a white background and accented with clear sequins. Same color combo on this card (just different lighting): aqua, green, gray, and navy. 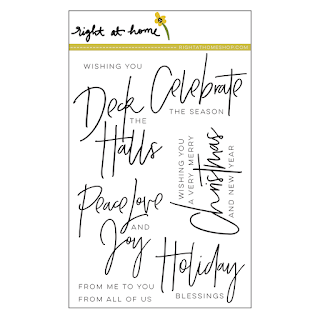 The sentiment is from PEACE LOVE JOY, also by Right At Home. I used a portion of one of the ornament layers to stamp some light gray accents, then adhered clear gems to the centers. I topped these ornaments with baker's twine for some texture. Along the left side of the background layer, I did some ink-blending and splattering in light aqua ink. 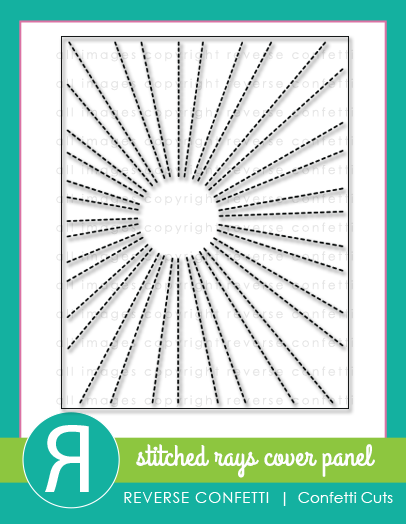 And along the right side, I added a scalloped border and some score lines for a subtle detail. That's it for today. I have three more cards to share on Sunday. 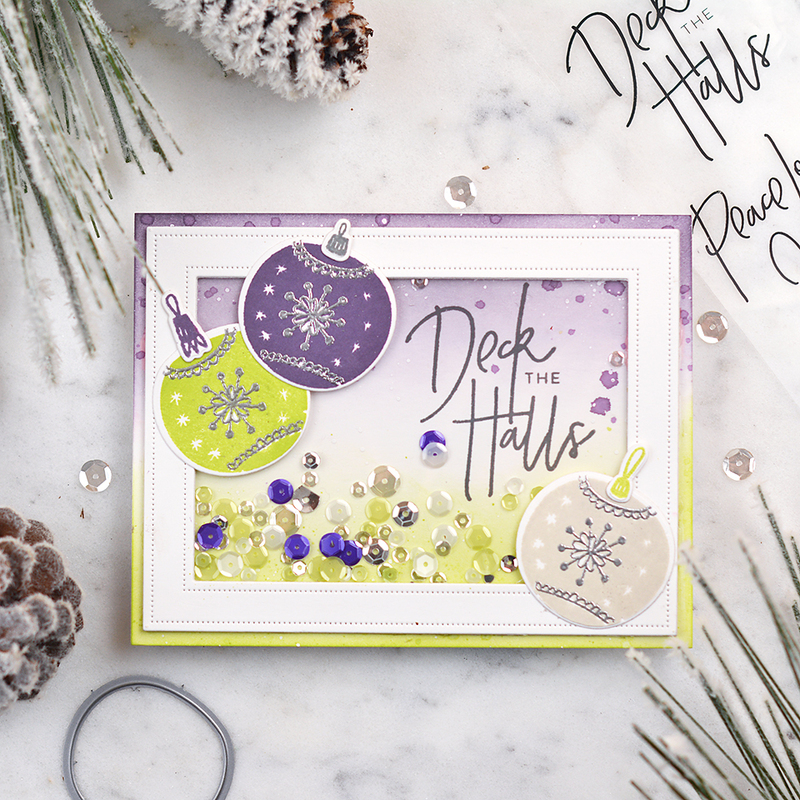 This first card features five of the six ornament styles. Each ornament has 3-4 different layers, which makes color building and layering super fun. 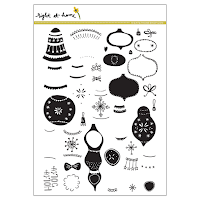 The ornament toppers and bows are separate images too, each with their own coordinating dies. 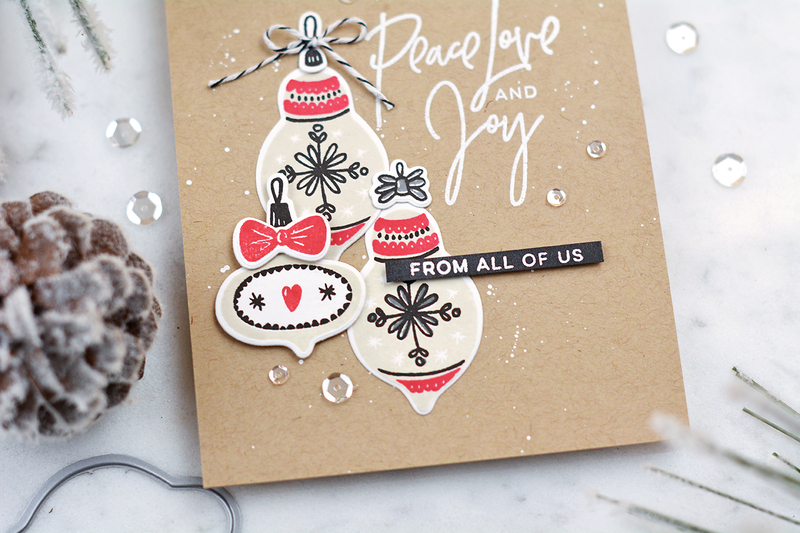 I arranged all of my ornaments around the large sentiment, which is from the PEACE LOVE JOY set. Finishing touch was a scattering of clear sequins. 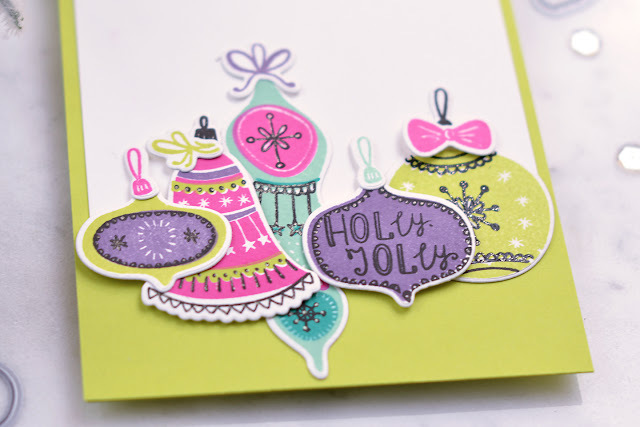 This could easily be turned into a one-layer card, too, just by stamping the ornaments directly onto the background. 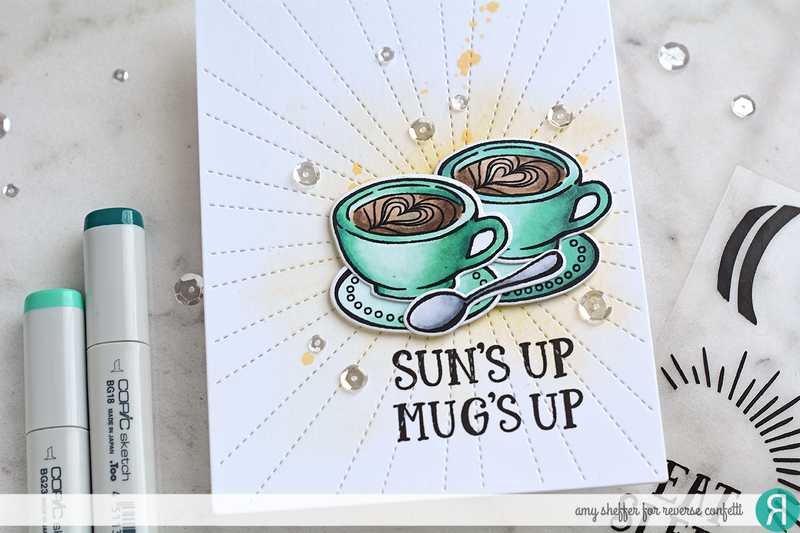 Personally, I'm a messy stamper, so all that stamping onto a *white* background would pretty much be a disaster waiting to happen - ha. 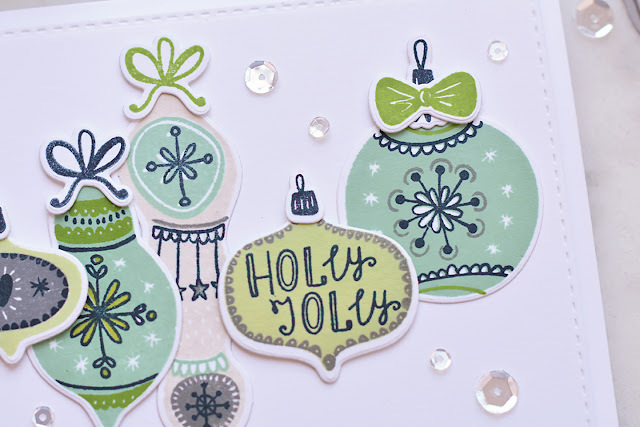 The coordinating BELLS & BAUBLES dies are a must for me! My next card is inspired by Scandinavian holiday decor, which is always a favorite of mine. I love all the neutrals with pops of red. 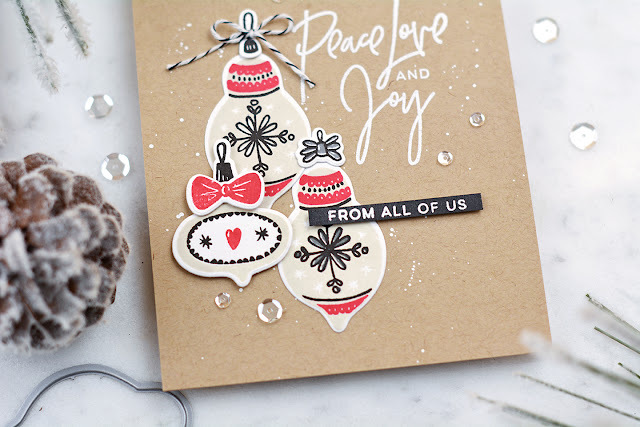 For this one, I stamped a trio of ornaments in a mix of light grey, dark grey, red, black and white and placed them onto a white-splattered kraft background. 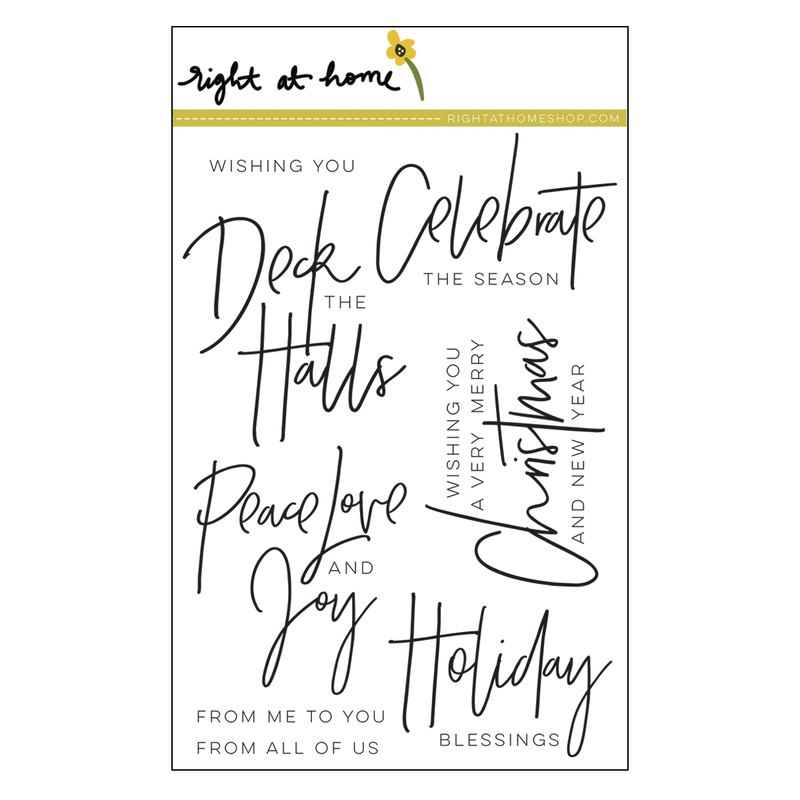 I used the same large PEACE LOVE JOY sentiment, but this time with "from all of us" rather than "wishing you." That's it for today. 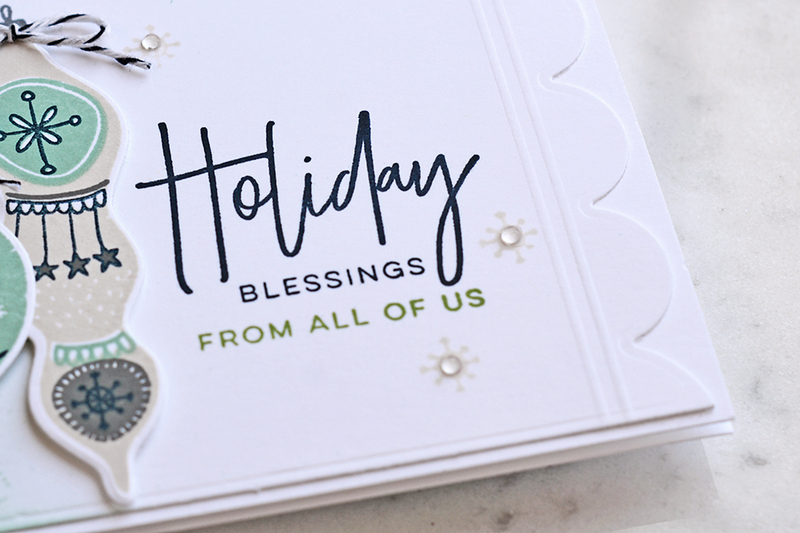 Check back tomorrow for more BELLS & BAUBLES. Hope you're having a great week. Thanks for visiting!